We will gladly respond to any questions about our glasses or product information. Please email us at 4iiiiZ@pocket-readers.com or call between 8am-6pm MST to talk to our 4iiiiZ Specialist at (855) 723-3377. Some people need to make slight adjustments to the nose pads. The nose pads can be "bent" in or out depending upon the need. We caution that this should not be done more than 3 times. 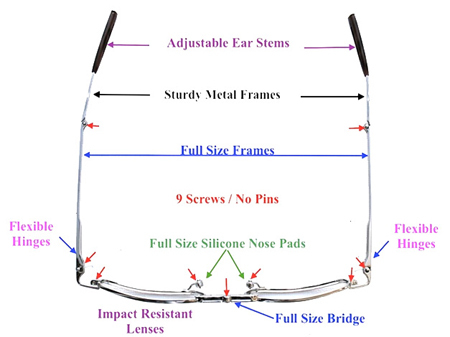 The replacement nose pads can be obtained at any optometry office With constant use, folding and unfolding the eyeglasses, the bridge may become "loose", to fix this issue just requires a small screw driver to tighten the screw. The temples extend an additional .75 inches. The first time they are extended may require more force. It is important when extending the temples to hold the temples behind the hinge to refrain from damaging the hinge. Use a soft cloth and a cleaning material that will not leave a residue. The LED has replaceable lithium batteries. Battery replacement requires the removal of the four screw on the back of the LED. The replacement batteries are CR-2013 and can be purchased in many retail stores. If the eyeglasses become damageg, we will replace them. Simply ship them back to us along with a payment of S2.95 for shipping. If you are interested in carrying Pocket-Readers™ in your retail location or adding them to your internet store, please call or email for partnership opportunities.